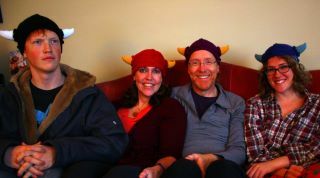 Last 4 viking hats of the season. Foster more creativity with my family. Provide my kids with tons of opportunities to be creative, craft, be musical, etc. Live more simply: Buy less, use less, reuse and recycle more, grow as much food for my family as possible, learn how to can and otherwise preserve food, shop at thrift stores more, recycle clothing, make the kids clothes, etc. etc. Write out, test, and publish all the patterns I have spinning around in my head. Finish all the half finished crochet and quilting projects laying around my house. Blog better and more often and otherwise build relationships with fellow crocheters, crafters, bloggers, etc. Here's to a beautiful 2012! Best of luck to all of you! Fabulous post!!! I am SO disappointed I moved away from Portland - I love to grow my own food and can as well! Ah, then those Music Together classes too, that was fun! Congratulations on all of your successes, and I am very eager to learn to crochet so I can purchase your patterns too!!! Happy New Year! Great picture! Your creations are fabulous! and I look forward to a year of creativity!